Alright guys, are you looking for a great new challenge? I might have something for you! But be aware it might change your life for good and you will change your point of view towards a lot of things. Before you seriously consider accepting the challenge I have to warn you, you will most likely change your mind about the following things: the media, Islam, trust, hospitality and tea. You reckon you can live with that? I still haven't scared you off? How about truck drivers offering you a little extra service? Nope? Man, really? That's gross! Haha, that was a joke.. or maybe not. You'll find out. Ladies and gentlemen, welcome to your personal guide called "How to change my life for good" or to keep it simple "How to hitchhike to Iran". If you don't have much time right now, I recommend you to read a little bit here. no.1 - Do I have the time for it? If you wanna do sick stuff you really have to dedicate yourself 100% to it. So I strongly recommend you to quit your boring job. You don't find your job boring? Why are you on my website then? Haha good one! no.2 - How much money do I need? Traveling on a budget is all about motivation, to leave your comfort zone and to challenge yourself. There is no recipe for traveling longer, further and better. 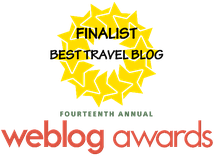 You won't just turn into a super traveler just by reading Nomadic Matt's blog. It's all about self motivation. Challenge yourself and beat yourself. The best way to do it? I will give you an example. Your budget for your three month trip is say $2000. That's not bad and easily earned in a month or two. 90 days divided by $2000 is $22 a day. That is good, considering you Couchsurf and hitchhike for most of the trip. And then let the mind games begin! Every day you spend less than $22 you become a little bit richer. Whatever you didn't spend the day before adds up to your budget. Imagine you hitchhike all day and all night long and your driver invite you for dinner (that happens all the time in Turkey or Iran) as well. That means you don't spend a single cent. Now add this 22 bucks to your new budget and you will see how much richer you become. Have an Excel table to keep track. no.3 - How do I keep my expenses low? As I mentioned above, have a strategy and challenge yourself, it does a lot towards your budget. But of course, try to be consistent with your hitchhiking and don't ever pay for accommodation. In Iran, people will invite you into their homes and worst case scenario pitch your tent or just crash somewhere next to the road. I'm talking about my very own experience and I never got into troubles or have been raped (it was mutual). Always be careful and make sure you don't get yourself into trouble. Once I jumped into a boat to get a little bit of sleep and I found myself in the middle of an ocean with some very angry fishermen. Drink a lot of water, it keeps you fresh and it is for free, always. I literally force myself to drink a lot of water just to stay hydrated. You just feel so much better by drinking at least two litres a day. Bad side effects? Yes, I did have to wee all the time. SHARE your stories with your drivers while hitchhiking. You will be amazed by how helpful they can be. I experienced days where I was afraid to share my story because I didn't think I could eat anymore. It really does happen and you don't have to feel bad. It's called KARMA and what goes around comes around one day. I always pick up hitchhikers and I make them eat because I was treated the same way a few years back. no.4 - What's the best route to take? So let's say you start your trip in Berlin, Germany. The shortest way to get to Istanbul is via Czech Republic, Slovakia, Hungary, Serbia, Bulgaria to Turkey and from there you can continue straight to the Iranian boarder. Easy hitchhiking and you can take some breaks in the capital of each countries. I always recommend a 3-4 day stop in each city, that's simply the best for your budget and you don't have to swap your Couchsurfing host. The more exciting route is via the Balkans though. It's definitely worth it and you will get to see a lot more. Start off in Berlin and stop in Prague, Brno, Bratislava, Vienna, Budapest, Belgrade, Sarajevo, Podgorica, Tirana, Sofia and Istanbul. Once you arrive at the Bosphorus, you deserve a rest to refill your batteries. There is nothing like Istanbul and there is so much to do and to see. It is also the best city to pick up your Iranian visa. After Istanbul you should go for the northern route along the Black Sea coast until you get to the probably most amazing country in the world, Georgia. After you get properly drunk with the locals in Tbilisi, move on to Armenia and get ready to enter Iran. On your way back you can go straight to Turkey and perhaps stop in Ankara for a few days. Back to Istanbul and from there try and pay Romania and Moldova a little visit. On your way back to Berlin you can try a more southern approach and stop by Croatia and Slovenia. It makes for a great round trip. 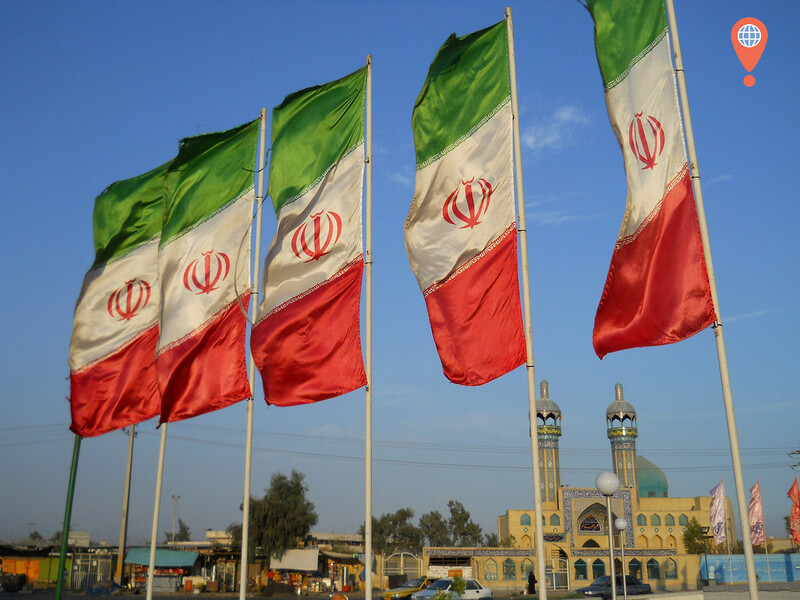 no.5 - How to get an Iranian Visa? There used to be an official Iranian Government website. That website has been down for a long time now. There are two options at the moment to apply for your visa. Option numero uno is to go an Iranian embassy or consulate, preferably in your own country. It will cost you around 60€ as a German citizen for example. It might be more for other nationalities. You need to expect a long waiting time though, at least two weeks. Sometimes during Islamic holidays such as Ramadan or Eid the waiting time can be twice as long. The second option is definitely the better one. It's more flexible and you save a lot of time. There is a website called Iranianvisa.com and they will help you with everything. You can even pick a consulate or embassy of your choice to receive your visa. 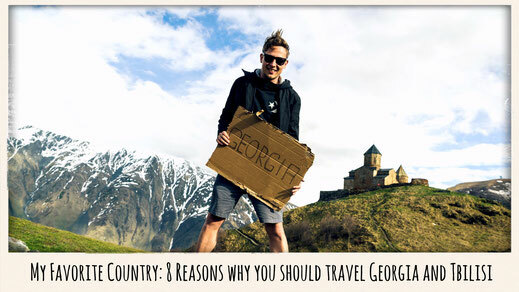 For example, you can choose Istanbul, Tbilisi, Yerevan or Erzurum. I usually recommend to pick it up in Istanbul. Why? Because there are many good reasons. First of all, it takes 24 hours to get your visa, for example if you get there on a Monday, your visa will be issued and ready to pick up by Tuesday. That means you can occupy your time with sightseeing and many other things. Another fact, the Iranian consulate in Istanbul is perfectly located in the city centre and very easy to find. Remember that Iran is an Islamic Republic and your appearance matters to them. Please respect its political and religious systems while you are at the embassy. I have seen people being rejected because of their ignorant and intolerant behaviour. For women it's important to slightly cover your head with a scarf. You can leave a great impression if you greet whoever is welcoming you at the counter by saying "as-salamu alaykum" it nearly translates to "peace be upon you". www.iranianvisa.com - The most common agency to apply for your visa. www.irantouristvisa.com/iran-visa-on-arrival - In case you fly in you can get a visa on arrival. Please check the requirements. no.6 - What to see on the way? BRNO - This beautiful little town, located between Prague and Bratislava is really worth seeing. A lovely market, a really nice old town surrounding a great church and there isn't anything better than to enjoy the view with a cold draught Czech beer. SARAJEVO - A place full of history, a place that makes you think in many ways. Shattered by war and assasinations, encircled and abused during the Balkan conflict and still drawn by the war, it never lost its charm. The pearl of Bosnia. TAKE A BUS FROM SARAJEVO TO PODGORICA - Don't ask just do it and you'll be amazed and stunned througout the journey. PODGORICA - The capital of Montenegro, full of life and young people. A modern city with a great nightlife and a spirit that will inspire you. TBILISI - I cannot hype this city enough! One of the most beautiful places I have ever been to. A stunning old town filled with very welcoming people. ISFAHAN - Check out the Khaju bridge and the Sotun Garden, it will blow your mind. 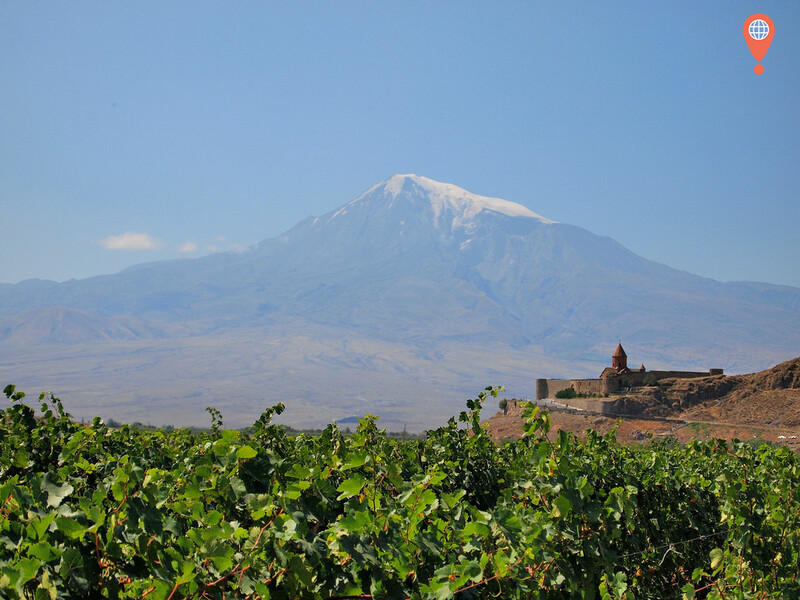 MOUNT ARARAT - Where according to the book of Genesis, Noah's Ark came to rest. A magnificent mountain, located in Turkey just next to the Iranian and Armenian border. TIMISOARA - the cultural centre in western Romania. LJUBLJANA - Slovenia's capital with its castle overlooking the old town. A must visit. 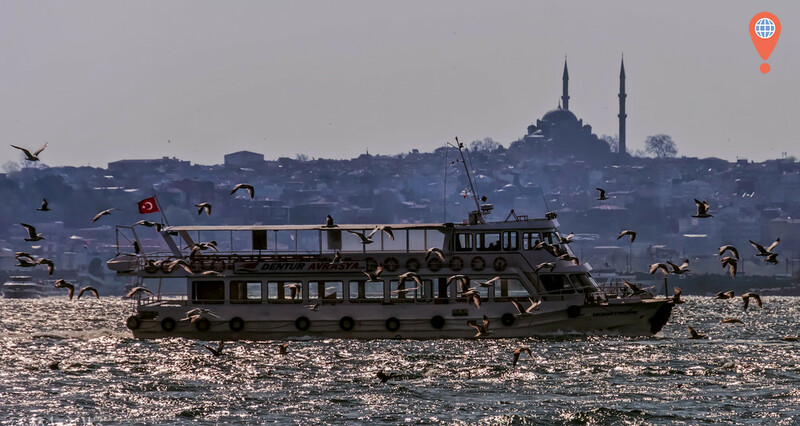 ISTANBUL FERRY - Take the ferry from the Asian to the European side (or vice versa) and have a cup of tea while enjoying the most outstanding view ever. no.7 - What is Iran like? Iran is the most inviting country in the world and its people the nicest I have ever met in my entire life. A Persian person is the perfect human being and makes us Europeans, Americans especially and perhaps Australians look like terrorists. I can vouch for that. Every day I was invited by strangers to eat with them. They helped wherever they could and hosted me when I was lost in the middle of the night in the streets of Tabriz. Not a single time was I asked for money or anything. Even when I tried to force them to take my money or whatever they wouldn't, I didn't stand a chance. I'm pointing this out because I'm tired of hearing how bad Iran and its people are. They aren't terrorists, only bad politicians who don't represent the majority of the Iranian folk. Not in my opinion anyway. It is still important to respect their religion though. Don't flirt with women and don't question anything regarding their customs. Be respectful and stay out of troubles. There is nothing to worry about if you do just that. Just be as mindful as you would be in any other country. 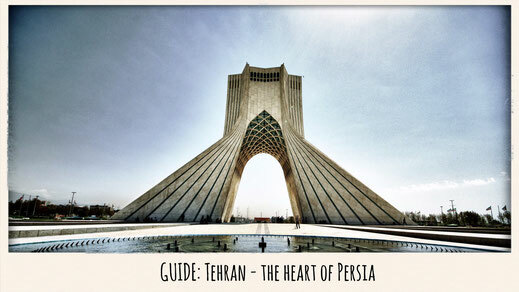 no.8 - What to see in Iran? You could spend months or maybe even years in Iran and you wouldn't get bored. It is full of history and culture. For some people Iran may appear like a big desert but even the countryside has a lot to offer. 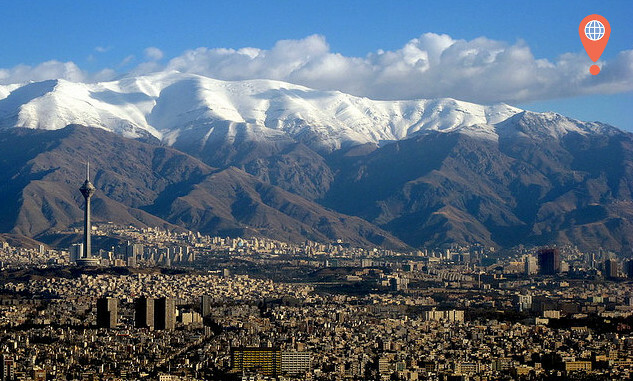 Tabriz for example in the north, was Iran's former capital. Not far from there you can find Lake Urmia, the biggest lake in the Middle East and the third largest salt lake in the world. Other attractions of course include Tehran, Iran's massive capital and one of the largest cities on earth, the Caspian Sea and the former city of Persepolis. Travel your way from north to south. Don't miss out on Isfahan, Yazd and Shiraz. Isfahan especially caught my attention and I was stunned by its architecture. 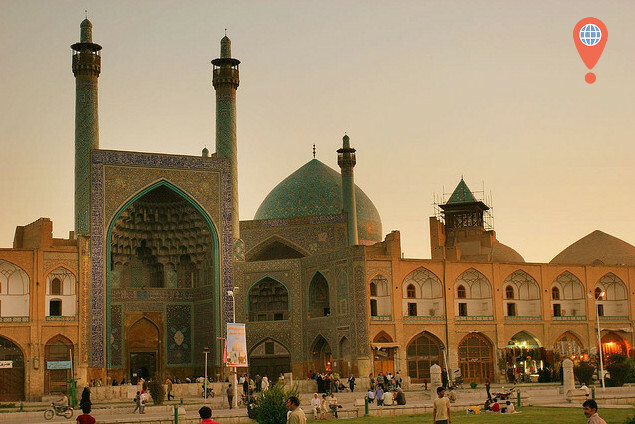 In the center of the city you will find the Naqsh-e Jahan square. It was so amazing that I sat there all day long and went for a little time travel back in the days when kings still ruled this amazing country. This square had such an impact on me and I won't ever forget this special occasion. no.9 - Couchsurfing and hitchhiking? I wouldn't really recommend an absolute rookie to go for this kind of trip. Especially the hitchhiking part can be tough at times. 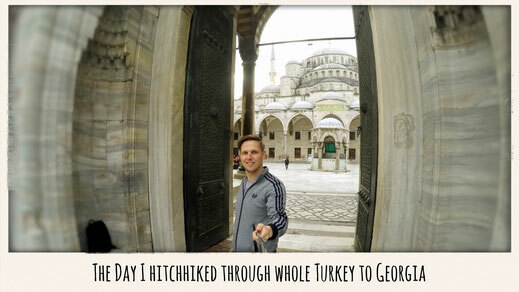 But generally speaking, you will be surprised how easy it is to hitchhike in Turkey, Iran or Romania. Don't really hitchhike during the night because you can get hit by a car really easily. Also avoid going into cities, you will get stuck. Make sure you dedicate at least half an hour to plan your trip for the next day. It is always good to have a Plan B.
I stayed at the most awesome places on my way to Iran. My favourite was probably the Swedish embassy in Prague. Before you go on your trip, dedicate some time towards your Couchsurfing profile. It will help you a lot to find a host. Make a rough plan of where you are going to be throughout your trip so you can contact potential hosts beforehand. A week in advance is probably the best time to get in touch. www.couchsurfing.org - largest hospitality network in the world. www.be-welcome.org - also very popular amongst travellers. www.hitchwiki.org - best website to plan your hitchhiking trip. no.10 - Important things you should know! - You bank cards such as Master Card or Visa, basically any card you have won't be accepted or working in Iran due to the embargo. Make sure to bring enough cash. - Don't leave the main streets in Balkan countries. There is still a high mine risk. - Istanbul experienced some massive demonstrations lately and people were seriously wounded during the riots. You should check on that matter from time to time. - Don't wear shorts in public in Iran. Many people don't know but it is prohibited. 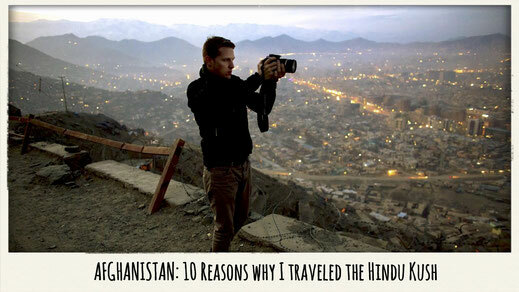 no.11 - Fun facts about my trip to Iran! - In Iran I was invited for a game of paintball with the Iranian National Paintball Team... very painful experience. - I got a straight lift from Istanbul to Georgia which is approximately 2300 km. - In Bosnia I spent the night in an open field. On my way back to the highway I saw a sign that said "DANGER, MINES". - In Prague I couchsurfed with the Swedish Ambassador at the Swedish Embassy. - I walked through the streets of Tehran with shorts on (later someone told me that short trousers are banned in Iran and you can get into serious trouble). - In Bandar Abbas I went to a football game and I was invited to the player's dressing room as an guest of honour. - On a bus from Tehran to Isfahan the guy next to me started masturbating, I asked him to stop because I thought it was inpolite, so he did. Plus: That was me on TV after the trip. ANY CRAZY TRAVEL STORIES YOU'D LIKE TO SHARE?